From left: Joann Hosey, director Bank of Ireland Connacht and Ulster; Minister for Community and Rural Michael Ring; and Northern and Western Regional Assembly director David Minton. Photo: Keith Heneghan. 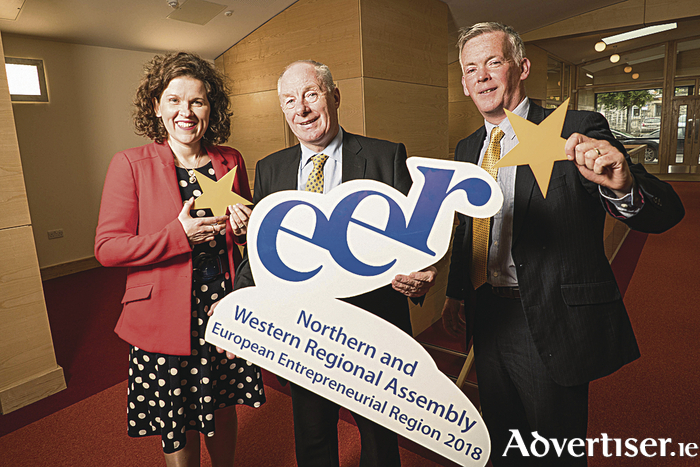 The European Union has this week named Ireland’s Northern and Western region as European Entrepreneurial Region 2018, recognising the enormous strides the region has taken to foster entrepreneurship and arrest decades of economic decline. The award, announced in Brussels by the EU’s Committee of the Regions, goes to the region because it has collectively developed policies that are transforming the area “from adversity to advantage”, in the process making it one of the most resilient and ambitious places in Europe. The European Entrepreneurial Region (EER ) award identifies and rewards EU regions and cities with outstanding, future-oriented, entrepreneurial strategies. The EER 2018 designation will be marked with a series of keynote events and initiatives all through next year to support and build on existing and new job creation projects and innovation across the Northern and Western region. The award comes at a crucial time for the region as it looks for ways to insulate itself from the unpredictable impacts of Brexit and offer an alternative economic focal point to Dublin and the east coast. The Northern and Western region comprises counties Galway, Mayo, Donegal, Sligo, Roscommon, Leitrim, Cavan, and Monaghan. In 2015, Northern Ireland was named European Entrepreneurial region. Other previous winners have included cities such as Glasgow, Barcelona and Lisbon. All have used the year to establish successful programmes and ongoing schemes to encourage innovation, business and job creation. The award was accepted yesterday on behalf of the NWRA region by David Minton, director of the Northern and Western Regional Assembly (NWRA ), the regional body which administers EU development funds. “This is an amazing honour and an opportunity for a part of Ireland that has been traditionally marginalised to emerge stronger and more attractive as a place to live and work for our young people, a viable alternative to living on the hugely overburdened east coast,” Mr Minton said. Mr Minton said this spirit of entrepreneurship was driven by the network of collaborative local enterprise offices (LEOs ) supporting more than 45,000 businesses. The concept of ‘entrepreneurship as a career’ has also come from smart programmes such as Young Entrepreneur of the Year and New Frontiers, Enterprise Ireland’s national entrepreneur development programme for innovative, early-stage, startups. The Government has also warmly welcomed the award. The Minister for Community and Rural Affairs, Michael Ring, said: “For me this award is about recognising the risk taker – from entrepreneurs to small business owners and indigenous enterprises growing in scale. The Northern and Western region is now finally being recognised as one of the most vibrant, responsive, and entrepreneurial places in Europe. Innovative and creative entrepreneurs across the region have led the way for young people, inspired a generation, and now are operating at a global level; all from the west of Ireland. This is just one example reflected in every corner of this region. In Galway, the work of the LEO is key to fostering economic development and the support of early stage companies that can go on to create jobs. “Galway is one of the most innovative places on the planet,” said the LEO’s head of enterprise, Breda Fox. “The convergence of art, history, culture, and research has created a local entrepreneurial ecosystem that is truly transformative.